AstraZeneca rejects another Pfizer offer, possibly putting an end to the world’s largest drugmaker’s quest to takeover Britain’s second largest pharmaceutical company. The new £55 per share bid valued the UK firm at £69 million ($116 billion), a 15% increase on its May 2nd offer. 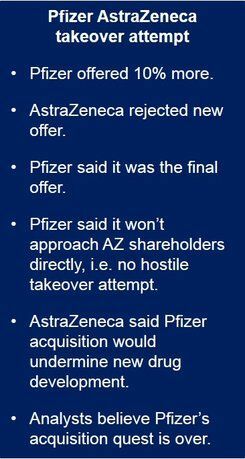 Pfizer announced that the new offer cannot be increased any further, and added that it will not bypass the AZ board and approach shareholders directly, i.e. it will not attempt a hostile takeover. If this is really true, then the battle appears to be over. The new bid included £24.76 in cash and 1.747 shares in the new company, worth £55 for each share held. If the deal had gone through, Pfizer, the world’s largest drugmaker, would have acquired AstraZeneca, the seventh largest, and created a pharmaceutical super-giant. The new company would have been based in London for tax purposes but would in effect be headquartered in New York. Corporate tax in the UK is 21% compared to 35% in the US. Moving its head office to the UK would have saved Pfizer billions of dollars in tax each year. UK and Swedish lawmakers, as well as unions and scientific associations expressed deep concern regarding Pfizer’s intentions. Historically, the American company has a reputation of buying smaller pharmaceutical firms and considerably reducing their research and development activities. When interviewed by the parliamentary Business, Innovation and Skills Committee, Ian Read, Pfizer’s CEO said a merger would probably result in the reduction of R&D jobs. AstraZeneca’s CEO, Pascal Soriot, said before the Committee that a Pfizer acquisition could undermine its development of breakthrough cancer medications. Pfizer wrote directly to UK Prime Minister David Cameron making a list of pledges, which included not reducing R&D expenditure and maintaining UK job levels. US lawmakers then asked whether those assurances meant the loss of jobs in the United States. Could the deal have been vetoed? The UK government is authorized to veto certain deals, such as those of media and defense companies; it can also apply a “public interest test”. For a Conservative administration to do so in this case would have been highly unlikely. Even if the government had tried to intervene, European Union laws would have significantly limited its actions.